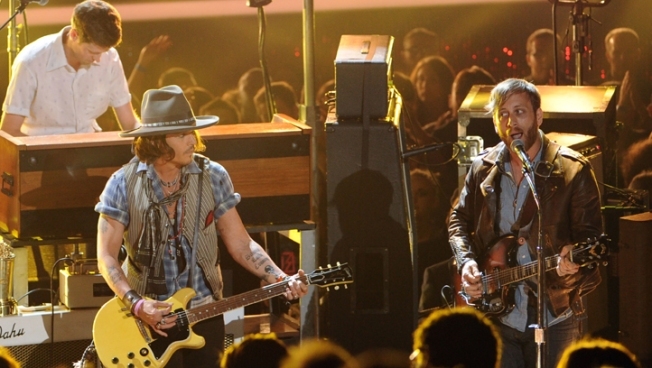 Johnny Depp celebrated his MTV Generation Award by trading licks with Dan Auerbach of The Black Keys for a rendition of the bad's song "Gold on the Ceiling." Johnny Depp, probably the most successful failed musician in Hollywood, celebrated his 2012 MTV Movie Award in style. Joe Perry and Steven Tyler, the lead guitarist and singer of Aerosmith, respectively, took the stage to present Depp with the 2012 MTV Generation Award, in recognition of the actor's body of work, introducing a lengthy montage of Depp’s films from his career. Rather than taking the microphone to acknowledge his latest trophy, Depp celebrated by strapping on an electric guitar and rocking out with The Black Keys for a house-shaking rendition of “Gold on the Ceiling,” from their album “Brothers." As the final chords wound down, Tyler handed Depp his award and said, “It’s all about you, Johnny,” before leaning forward to launch something from between his famous lips, causing Depp to laugh.